In my last newsletter, I wrote about the inevitably of change. One of the certainties of life is that things will change. Some things we will change by choice, such as our job, our furniture, our hairstyle and even sometimes our spouse. But some of the changes we face are unwanted and unwelcome. We did not choose them. They choose us, and if we don’t handle them well, we can become unglued. Whether it’s an unexpected job loss, health problem, divorce or simply losing our luggage or wallet while on vacation, changes happen. Most time we don’t know why, but we can successfully navigate through unwanted changes if we learn to do these three things. Accept change: In my last newsletter, I talked about accepting unwanted change. Many times we acknowledge the truth of what happened but we refuse to emotionally accept it. We get stuck in the anger of “this shouldn’t have happened this way." In doing so, we resist the change and fight it. On the other hand, acceptance allows us to move through our anger to grieving the losses we face because of the change. Allow yourself to feel your painful feelings. Let them serve their purpose. They are here to teach us something about life, about ourselves or about others. Learn from them, but don’t coddle or save them, especially when they’re negative. They become more toxic the longer we hold on to them. The second thing we can do to face unwanted changes is to prepare for them. Prepare for Change: When we accept that life changes, we prepare for it best we can. Make sure your will is up to date and you know where your spouse keeps financial records and insurance policies. Preparing for your own death or your spouse’s death doesn’t erase the loneliness, but it sure mitigates some of the stress. Ask your aging parents to do likewise so that if they die suddenly, you know what their wishes are and where they keep their financial records. In the midst of grieving, you don’t want to feel angry at them that you have to spend precious time figuring out where they kept their things. Is empty nest sneaking up on you? What are some things you can do in preparation for the changes you will face once the children are all gone? Do you feel called to a specific ministry or to go back to school to finish up a degree long ago abandoned? What are some things you can do today to refresh your relationship with your spouse now that you won’t have kids to distract each of you? We all know even the best preparations don’t always hold up. Those who prepared for retirement are now facing less than they thought they would have. The apostle Paul said that he learned the secret of contentment. He enjoyed whatever God gave him without holding it too tightly. We can practice not clinging in small ways today in order to prepare for letting go in bigger ways later on. Part of accepting unwanted or unwelcome change is learning to let go of our dreams and wishes of what could have been or should have been so that we are free to embrace what is new in our lives. Embrace Change: When we embrace change, we don’t deny that there is a problem or pain, but in the midst of it we ask ourselves the question, “How can I sit with this in a good way?" Several years ago, my younger brother lost his wife to cancer. They were high school sweethearts, and it terrified him to be alone. He didn’t know how to do many of the things his wife normally handled, but he decided he could learn. Although he would never have chosen this path, he’s learned things about himself and his strengths in ways that would not have been possible if he had not embraced the unwanted changes in his life as a result of widowhood. When change is unexpected and unwelcome, our attitude is the only things we can still control. When we choose to stay positive and look for the good in a situation, we often discover unexpected blessings and opportunities that would have never happened had not this change entered our life. Although my brother would have never wanted his wife to die, he now says, “I am not the same man I was back then. Not only my life circumstances have changed, I’ve changed. I was reborn. This is a very good thing." What unwanted changes are you facing? You can learn to accept them, prepare for them and embrace them and thereby transform their negative impact on your life. Question: My husband's a slob! He drops his clothes on the floor and he never picks up after himself or helps around the house. I'm exhausted and I'm tired of asking for help. Answer: It can be frustrating to live with someone who has different habits than we do. But before we get into what you might do, I want you to ask yourself two crucial questions. First, is your husband usually caring and respectful of your feelings and needs? Second, is there a reason why he's not helping you around the house? For example, he might be exhausted from his job, or busy helping you with the kids, or could it be he's tried helping you in the past and you've not been satisfied with the way he helped so he gave up? If you answered yes to either of those two questions, then you have a couple of options. One is to lower your house cleaning standards so you're not so exhausted. All spouses have weaknesses and one of your husband's is messy habits. God tells us that we need to learn to put up with one another and to accept each other, encouraging the good we see (Romans 15:7; Ephesians 4:2-3). Try focusing more on your husband's strengths instead of dwelling on what he doesn't do well. Another biblical approach would be to implement the law of sowing and reaping (Galatians 6:7). Calmly say something like this, "Honey, I know you hate my nagging. I hate it too. So from now on, I'm not going to nag you about your clothes but I'm also resigning as your personal maid. Starting tomorrow, if your clothes don't make it into the hamper, they won't get washed." Stay kind but firm. Soon he will realize he has no clean clothes to wear and will begin to put his clothes into the hamper. Hopefully as he learns this new step in taking care of his clothes, he will also start to pick up his other items around the house. On the other hand, if your answer to those earlier questions is no, you have a much bigger problem than a messy husband or house. Your marriage lacks mutual caring and mutual respect, core elements in any good relationship. If you want to change this pattern, you must start with yourself. Are there any past hurts that have caused this breakdown? If so, own your part and ask for forgiveness. 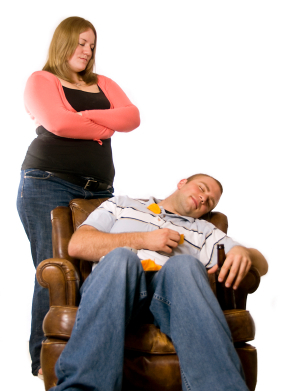 However if your husband's basic attitude toward you is often selfish and disrespectful, you may need additional support. I encourage you to take my free test, "Are You in a Destructive Relationship?" which is available at my website: www.LeslieVernick.com on my free resource page. You will also find resources to help you deal with a destructive relationship and initiate difficult discussions. God wants your marriage to change. Allow Him to use you, and others if necessary, to help your husband make these important changes. Reregister To Continue Receiving Our Newsletter! Plus listen in to Leslie's upcoming interview with Focus on the Family! A sneak peak at the cover of Leslie's new book! 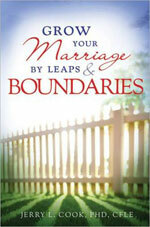 Grow Your Marriage By Leaps & Boundaries Book by Jerry L. Cook. Plus see the winner of the previous give away! My husband's a slob! What can I Do? LESLIE'S UPCOMING INTERVIEW WITH FOCUS ON THE FAMILY! 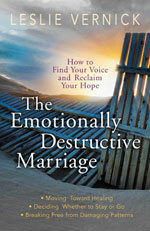 We are pleased to share that Leslie's interview with Focus on the Family,"Responding Well in Marital Conflict" is scheduled to air on February 18 & 19, 2013. Growth is essential in keeping a healthy, satisfied relationship with your spouse, but a marriage's growth can be stunted through difficulties with financial concerns, physical relations, and parenting decisions. Marriage expert Jerry Cook has a breakthrough approach to marriage that turns these difficult decisions into progress, bringing you and your spouse closer than you ever were before. Just email your name to assistant@leslievernick.com by midnight Friday, February 22nd for a chance to win one of two copies! Congratulations to Jacqueline Y. and Ruth N. winners of the SPIRIT HUNGER book by Shannon Ethridge.